Join your Chief Adventurer on a guided ATV excursion through the majestic Sonoran Desert. Immerse yourself in the history of this forbidden frontier. Discover the abundant flora and fauna which inhabit the Tonto National Forest. Experience the thrill of navigating through seasonal creeks, sandy washes, rocky riverbeds, and rugged desert trails. All ATVs are fully automatic. If you’re looking to ramp up the excitement, look no further than the ATV Adventure package. With this unique option, you’re in control! 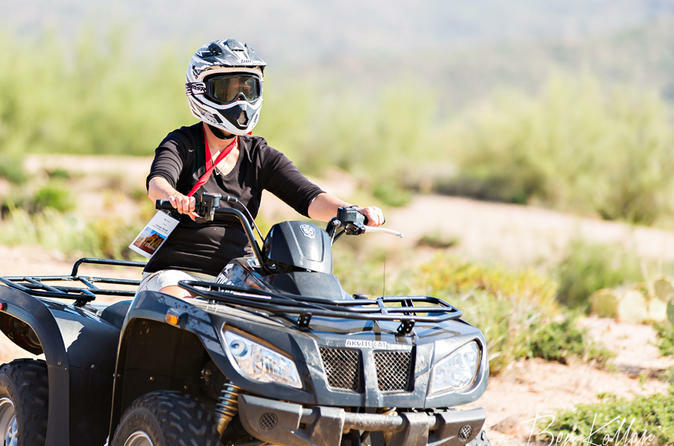 After the standard safety rundown, you and your Chief Adventurer will hop on your fully automatic ATVs and hit the trail, winding through the diverse and beautiful landscape of the Sonoran Desert. This area features some of the most secluded off-roading trails in the Southwest, and rest assured—your Chief Adventurer knows all the best ones. The Sonoran Desert is arguably the best-kept scenery secret in the Southwest. You’ll know it when you take in the sights, gazing out over the pristine landscape and the untouched, raw beauty of the desert. Take in the bright, unique flora and exotic fauna—like the only jaguars that roam the U.S.—and appreciate the courage of the native peoples and the frontiersmen who traversed these paths years ago. The vast Tonto National Forest offers a striking contrast to this desert scene, with lush pine trees that offer shade, respite from the hottest desert in North America, and a bit of mystery. Your guided ATV tour will offer you glimpses of this rugged beauty, all from your front row seat on the ATV. But if you think this is going to be a leisurely roll through the desert, think again—this isn’t your mama’s ATV ride. Your Chief Adventurer will challenge you to ford seasonal creeks, traverse sandy washes, ascend rocky slopes, and zoom along the flat desert trails. The Sonoran Desert covers more than 100,000 square miles, so there’s plenty to explore. Depending on your skill level, you may cover up to 25 miles of ground, but the trail you follow has been selected because it features some of the most diverse, majestic scenery and landscape that the Sonoran Desert has to offer. Your Chief Adventurer isn’t just another pretty face: All of the guides can answer your questions about the native cultures, plants, and animals you may see while you’re out.